Andrew’s nursery is finally done and I’m so excited to share the finished product. 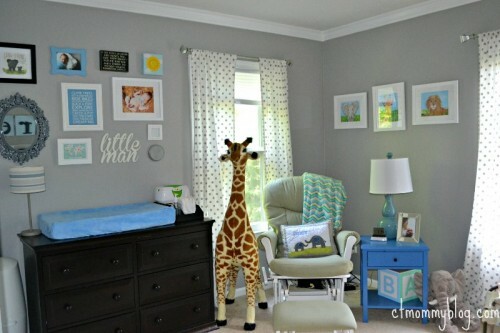 We went with a modern safari theme for his baby room. I didn’t want anything over the top or too babyish. It needed to be something that he could grow into. I love the way everything came together. Check out the finished product. 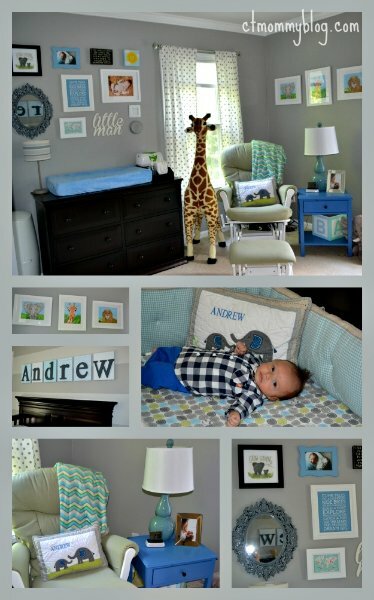 I used Pinterest and Project Nursery to gain inspiration for our baby boy nursery. 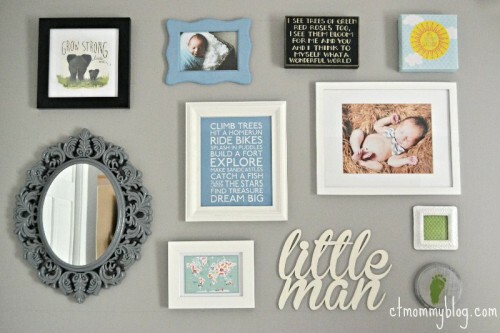 There are some handmade projects and several details purchased from Etsy. Everything revolved around our green glider. 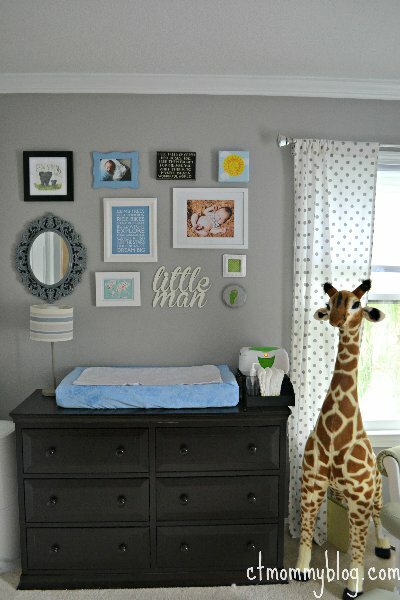 It had been used in the girls’ nursery and I knew we could make it work in the new nursery as well. 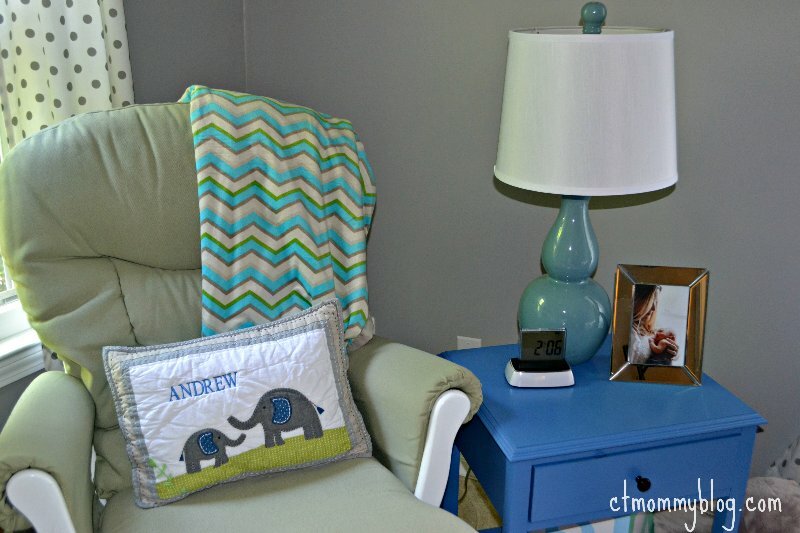 We chose the color palette of gray and blue with hints of green. 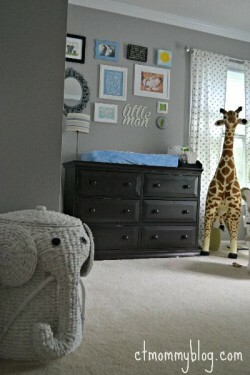 Our Pottery Barn Kids Brooks bedding was the perfect mix of all our colors and inspired our safari theme. 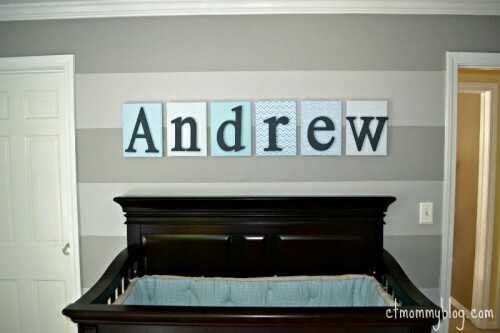 We started with the gray striped wall as the focal point behind the crib. 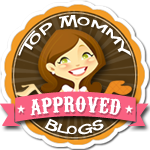 It was something I had been loving on Pinterest and wanted to try out. We used two shades of gray to get the perfect look. Above the crib I created DIY wall letters spelling out Andrew’s name. 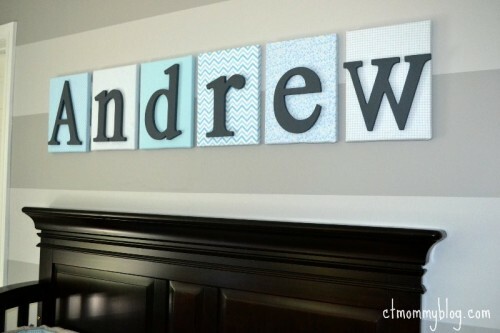 I had seen similar letters on Etsy priced between $20-$25 each. I knew that I could get the same look for less money. One of my favorite features of the room is our gallery wall. I had been wanting to put up a gallery wall somewhere in the house and the nursery seemed like the perfect spot. I’ve been collecting pieces for a few months. It helps to warm up the gray walls. 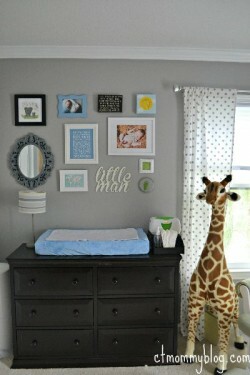 One of the other big projects in the nursery was the closet redo. We live in a 1910 farmhouse so you can imagine that closet space is limited. 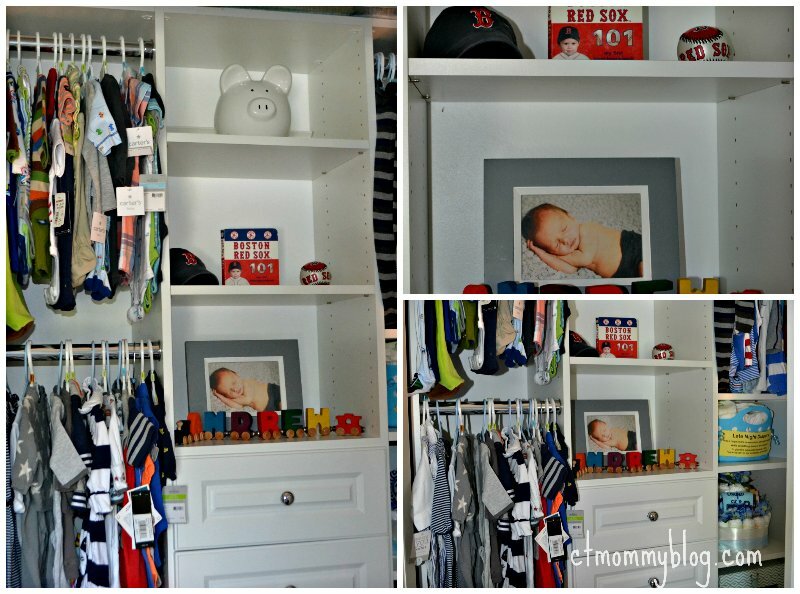 We used EasyClosets to create a more functional closet to hold all our new baby clothes and items. 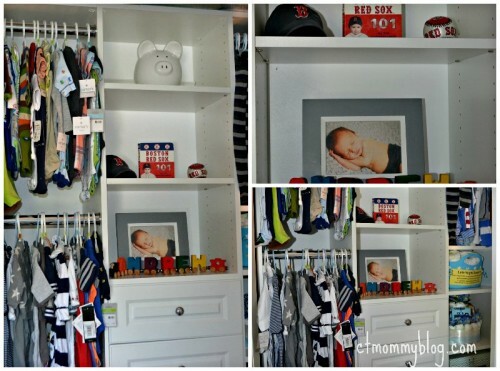 There are shelves to display pictures and special keepsakes, plus drawers to hold tiny baby socks, onesies, and accessories. We love the way that the nursery turned out. It’s so special putting our baby boy to sleep in there every day. 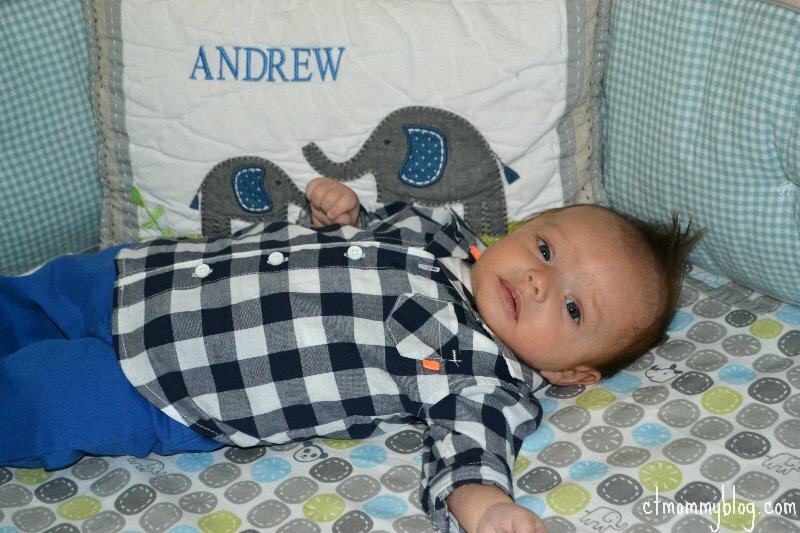 We hope he grows up to love it as much as we do.